The human-machine model is a person interacting with a machine in some kind of environment exchanging information. Every relationship between a person and a machine can be described as an “experience”. The experience consists of objective (factual) and subjective (instrumental) information. Both levels can be leveraged on either an empirical (what-is) or conceptual (how what-is relates to what-ought-to-be) level. 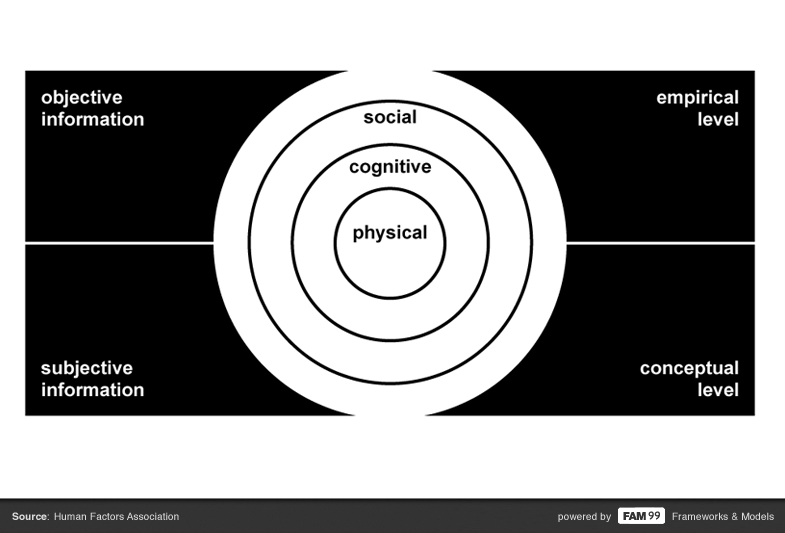 The environment can be characterized physically (e.g., vibration, noise, zero-gravity), cognitively (e.g., time pressure, uncertainty, risk), and/or socially (e.g., organizational structure, job design).